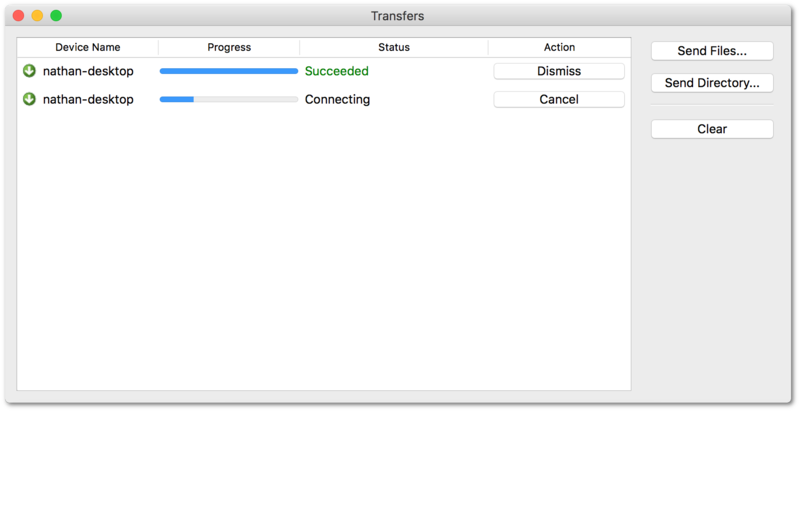 NitroShare is designed to make transferring files from one device to another extremely simple. NitroShare was designed to be simple. The application uses broadcast discovery to find other devices on the local network with NitroShare installed. NitroShare is built to take advantage of fast networks, easily achieving gigabit speeds on capable hardware. NitroShare runs on Windows, macOS, and Linux. Files can easily be transferred between machines running different operating systems. NitroShare is written in modern C++ and makes use of the excellent Qt Framework. All of the source code for the application is released under the MIT license. In order to use NitroShare on your local network, you will need to install the desktop application on each device that you wish to use for transferring files. We maintain a Jenkins CI server with up-to-the-minute builds of NitroShare for Windows and macOS. Ubuntu users can use our dev PPA. NitroShare is designed to run on a wide variety of Linux distros and desktop environments. "macOS" is a registered trademark of Apple Inc.